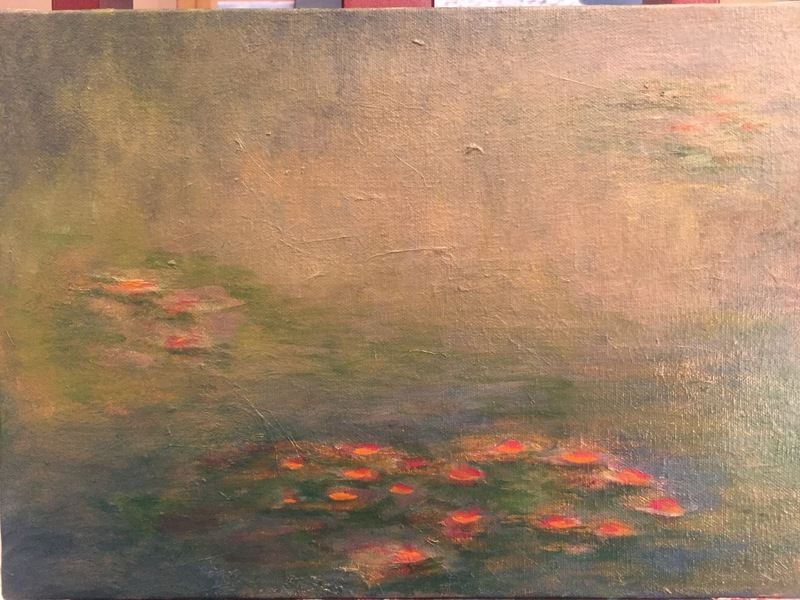 Artistic Adventures: Monet! Monet! Monet! Back in October, I had the good fortune of visiting the Tokyo Metropolitan Museum of Art to view the Monet Exhibition. I LOVE MONET! I have always loved Monet... Monet is what originally inspired me to pick up a paint brush. Most people remember everything about a moment that changed their lives. Ask someone where they were, what they were doing, what they were wearing - and they will tell you. 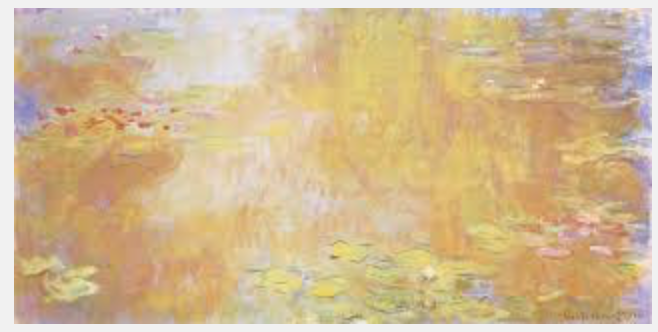 I remember the first time I saw Monet's The Water-Lily Pond, 1917. I was 28 years old; however, I couldn't tell you where I was, what I was wearing or what I was doing because all of that just. didn't. matter. I do remember that I saw the painting in a book - not in a Museum. And still. All I cared about was getting as close as possible to the painting to look at the color. How did he DO that?! How did he combine yellows and pinks and gray and blues and greens and reds and make it look so "obviously a pond of water-lilies"?! Separate and individual small, medium, large brushstrokes of color interconnected and interwoven to represent a composition. Brilliant! Someday, I would learn how to paint. Claude Monet was born Oscar-Claude Monet or Claude Oscar Monet on November 14, 1840. He was the founder of French Impressionist Painting and heavily influenced by his friends, Renoir, Bazille, and Sisley. Manet was also a friend, and together they would all experiment, share ideas and develop the use of rapid brush strokes in a broken color format to lay the foundation for a new style of painting, called Impressionism. 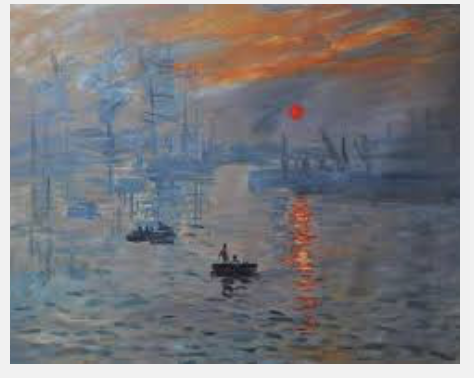 In fact, the term Impressionism is derived from the title of his painting Impression, Sunrise. Who was Claude Monet? He would live a full 86 years, enriching the world with his paintings. 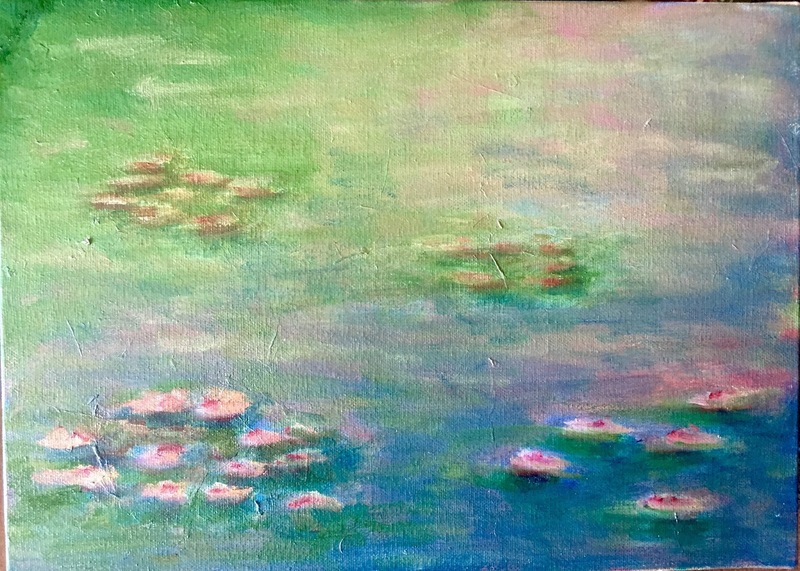 Now that I am a painter, I thought I would give Monet a try. And so, on a couple of smaller canvasses (much smaller I should say - specifically 33.5 x 24cm), I gave the concept of Monet's Water Lilies a try on a background of gold and silver metal leaf. While I didn't quite mimic the use of broken color, I did quite a bit of blending and used several different hues. The goal was to allow the metal leaf underneath to provide a background of luminosity upon which the water lilies would float. 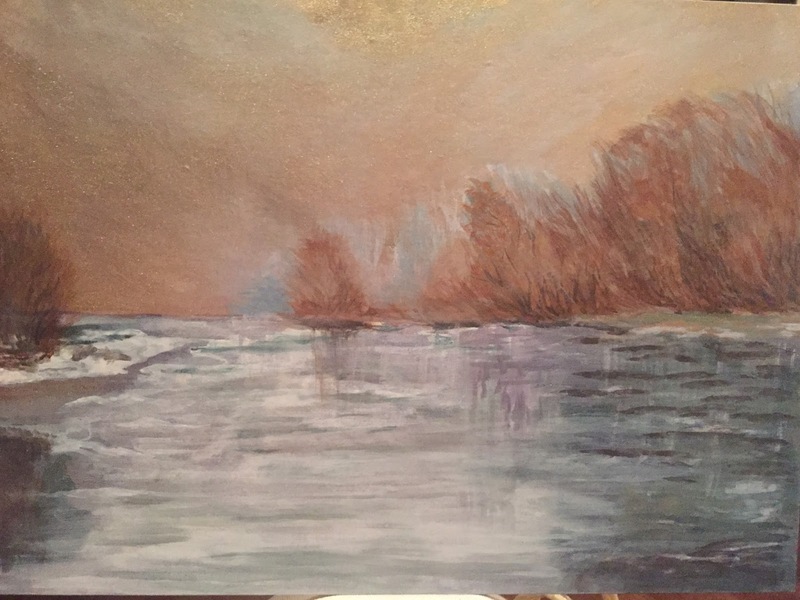 I am not Monet - but I was pleased with the outcome... and can't wait to try more! In Japan, one way to teach an artist is to have him/her literally "copy" a Master's work. Learning the technique and mixing the colors that the master used to recreate the same composition is an efficient way to learn as it is easy to see where one is making a mistake. "Blending" is key in a composition of Monet. And different mediums require different methods of blending. Recently on vacation, I participated in an acrylic workshop so I could experiment with the fast-drying medium. While Oil is infinitely easier to blend due to its slow-drying properties; acrylic can also be blended with the use of water. But! It was hard to manipulate! 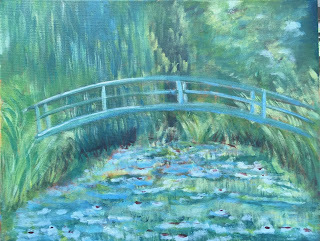 I "re-created" one of Monet's Japanese Bridge compositions below. Lastly - I am also in the process of trying out "blending" in the Japanese Ink Wash medium. I do find this medium to be easier to work with versus acrylic - and love the delicate quality the ink wash gives to the composition. This one is still a work in progress and I will share the final one in a future post - but you will get the idea. One addition to the ink wash is the use of iridescent pigment mixed with water in the gold and green colors. It is this iridescent pigment that offers the luminosity in the painting below. 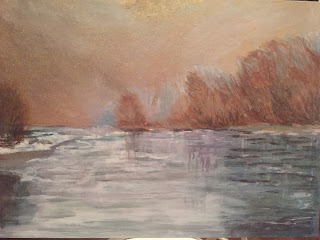 It is my hope that one day - I will be able to assimilate my own version of Impressionistic style into my paintings - which means a lot more practicing Monet for me!